Bindoon Primary School students Nash Young, Hartley Preston, Fletcher Preston, Isabelle McAuliffe and Jasmine McAuliffe with Avalon Orchard owners Jenny and Tony Maddern and Bindoon Primary School P&C president Amy McAuliffe. THE Bindoon Primary School Fete and Mango Festival will celebrate the start of the 2017 southern mango season on the first weekend in April. The school’s mango-themed fete to run at its Learners Way ground on Saturday, April 1 with the help of local growers will include homemade jams, chutneys, and trays of fruit on and a mango menu. Unusual conditions delayed the season by more than a month with picking now underway around Gingin, Bindoon and Dandaragan. 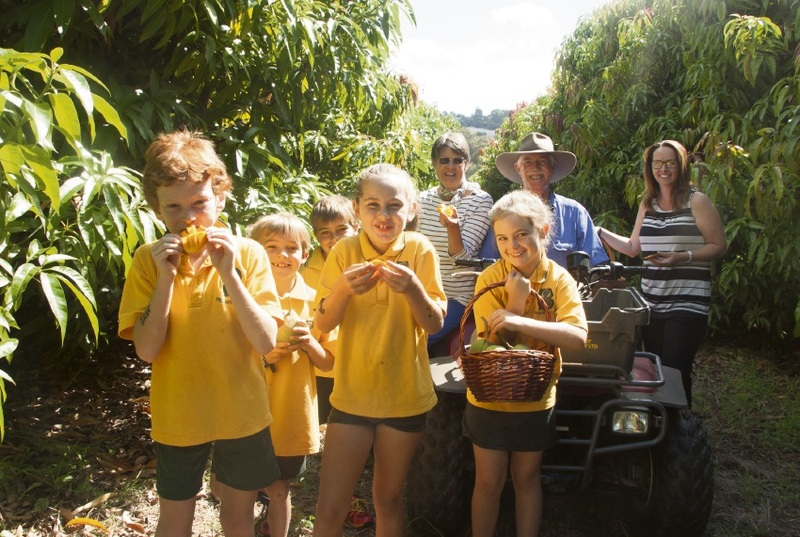 Avalon Orchard owners Jenny and Tony Maddern, who are supplying the $30 mango trays for the school to sell, were relieved fruit was finally showing signs of readiness. Bindoon students recently collected some from the property to donate for the festival’s mango menu. “We are thrilled to be collaborating with the school to sell our local produce; it’s a win-win for everyone,” Mr Maddern said. P&C president Amy McAuliffe said the inaugural festival would give people a chance to enjoy tasty local fruit, support local growers and to learn about local agriculture. “We anticipate it will become an annual community event,” she said. There will also be children’s entertainment such as rides, activities, games, tug-o-war, bouncy castles, face painting and stalls at the April 1 event to run from 8.30am to 2.30pm. For more, visit Bindoon Primary School Fete and Mango Festival on Facebook.